When you live in a cold-weather state if you haven’t already had the discussion about why your energy bill is so large, now is definitely the time to re-introduce that topic and re-think replacement windows. Brutally cold temperatures and wicked winds wreak havoc with the cozy warmth you seek in your abode during the Winter season. If you stand close enough to the window, you can feel the draft coming in. But, strange as it sounds, if your windows are old and drafty, they are also allowing hot air to seep in and undo the cool temps your air conditioning unit is cranking out all Summer. Some tips on the most energy-efficient window frames are listed below, but your best bet for peak performance on replacement window frames is to go look at all the options by visiting a replacement window installation contractor in Howard County. The government website that specializes in consumer energy efficiency, www.energy.gov, suggests that “a window’s energy efficiency is dependent upon all of its components. Window frames conduct heat, contributing to a window’s overall energy efficiency, particularly its U-factor” (the rate at which a window, door, or skylight conducts non-solar heat flow). Therefore, based on this statement, you can ascertain that window frames are important to the overall energy efficiency of new replacement windows. Wood frames are excellent insulators because they conduct less heat or cold into your home. Do you worry about the wood warping? That tradeoff, in the long run, is worth investing in wood frames since they insulate 1,800 times better than the most-popular window frame choice, i.e. aluminum. Though wood is not as durable as aluminum because of its susceptibility to rot, if the wood frames are well built and maintained with a good primer and paint, they will last for many years. Wood frames are an excellent choice since, from a design standpoint, they work well with traditional as well as modern homes and a fresh coat of paint for the frames offers a color change for the home if desired. Fiberglass composite material frames also will give you the same benefit as wood’s insulating properties, with no worries that the frames will expand and warp in the Summer, or shrink and turn brittle during the Winter. A relatively new concept by replacement window manufacturers is a hybrid frame design that uses two or more frame materials to produce a complete window system. 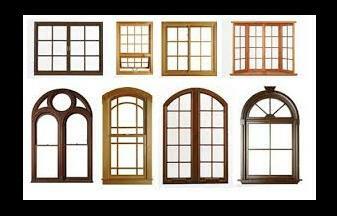 These “split-sash” frames may be composed of an interior wood element which is bonded to an exterior fiberglass element. The result is a much better-performing product at a lower cost, a pair of factors that make this product a good choice. Vinyl multi-chambered frames are superb at reducing heat loss to increase your energy efficiency and they are very easy to maintain. Vinyl frames are somewhat of a latecomer to the window frame scene. They are made of PVC which is a versatile plastic with good insulating value. Just like vinyl siding eliminates the need for repainting the house every few years, likewise, vinyl window frames do not require painting and have good moisture resistance. The color of vinyl frames goes all the way through, thus resisting deterioration over time, and, there is never a need to refinish them due to temperature extremes from scorching heat or bitter cold. Vinyl frames are comparable with wood frames as to thermal performance, with the exception of a few minor differences, depending on the frame construction. A subtle difference is that small hollow chambers within the frame reduces convection exchange, as does adding an insulating material. Aluminum frames are the least expensive of your options, and, though they are durable, they have a poor insulation rating, meaning the frames conduct more heat or cold into your home. They do have their benefits however. Even though aluminum frames are lightweight, they are strong and durable. Another plus is they are non-corrosive. Manufacturers like the fact that aluminum can be easily fashioned into the complex shapes required for window parts. As to maintenance with aluminum frames, there is nothing to be done on your part since the frames are available in anodized and factory-applied, high-performance painted finishes which will look good for years. They are still a popular option, despite the fact that in a cold-weather state, like Maryland, an aluminum frame easily will become cold enough to cause moisture or frost to form on the inside surfaces of the window frames, causing heat loss and condensation problems, concerns which are not found in mediums like wood, fiberglass composite or vinyl materials.